A lipoma is a benign growth of fatty tissue that is usually found just below the skin. Lipomas can occur almost anywhere on the body. 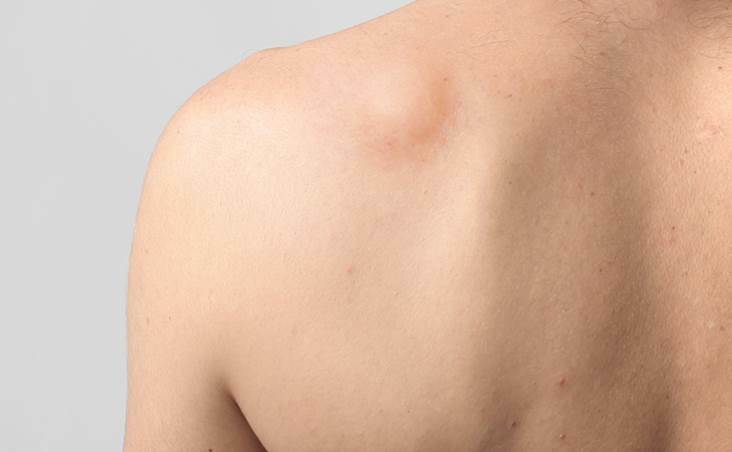 A lipoma can be described as a soft, rubbery bulge that feels like it can move because it is not connected to the overlying skin. Lipomas tend to grow slowly, often over a period of months or years. Lipomas rarely cause pain, and so most people have no symptoms. However, a person with a lipoma can have some pain if the lipoma presses on the nerves or has some blood vessels running through it. NOTE: lipomas are always benign, meaning that is it not cancerous and will not develop into cancer. There is no scientific evidence that a lipoma increases the risk of developing a cancer in the future. However, lipomas can sometimes be mistaken for a cancerous tumour called a liposarcoma. These are usually large (5 cm or more in diameter) and grow rapidly. If you are concerned about a lipoma which has started to increase in size you should book an appointment so that we can have a look at it and potentially perform a biopsy or send you for imaging studies. In most cases, however, we will just monitor the lipoma unless your preference is to remove it for cosmetic purposes.